You don't have to test your credit limit (and then some) just to have a reception in a beautiful location with delicious food. Here's how to rent a sensational space and put together the menu of your dreams, whether your budget is little or limitless. Whether you're married on an off-peak day—aka not Saturday—or a less popular time of year (generally late fall through the winter), you'll probably score a sweet venue for a steal. This isn't an easy thing to do — until you see the savings start to accrue exponentially. You'll seriously save on catering by feeding less people and on your invitations (not to mention postage). And having a smaller space also means less décor and rentals. Go with a venue that's ready-to-roll. If you're a big Father of the Bride fan, you might have your heart set on a wedding at home. Well, George Banks flipped out throughout the film for a reason — a bloated budget. Between rentals on everything from tents to toilets, creating an event where they usually aren't hosted (whether it's a home or a bare-bones venue) costs a lot more than a traditional venue. It seems weird, since a sit-down dinner can seem more formal and expensive, but stations mean people can take as much as they want, so your caterer will need to cook more food just in case Uncle Bob decides to see how many beef satay skewers one man can eat (the answer: too many for a tight budget). That said, a buffet will save you on labor costs. Family-style is a third option that's currently having a major moment. Plus, it cuts down on food waste (since people only take what they want to eat and don't have the option to eat more than what's on the communal plate). Talk to your caterer or venue coordinator about which is the cheapest option for your particular party. Offer your guests beer, wine and a fun signature cocktail. 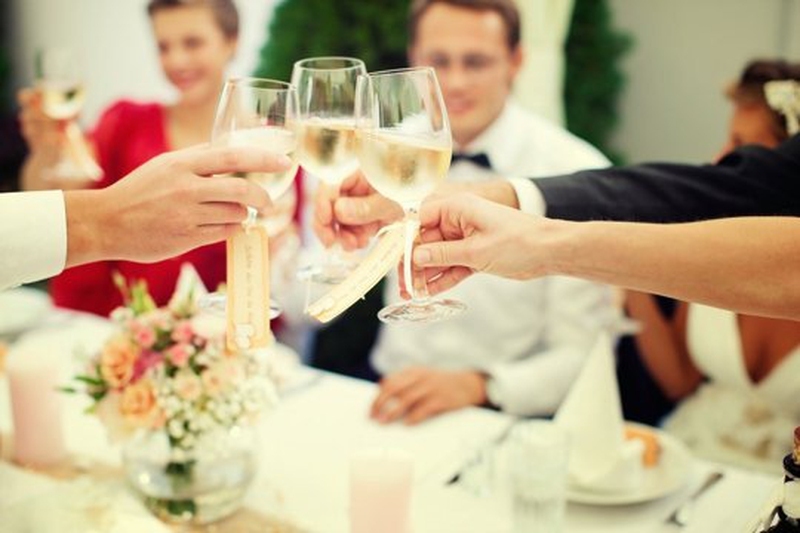 Since your venue or caterer won't have to uncork tons of different bottles (usually with an "if it's opened, you bought it" mentality), you'll save money without having thirsty guests. Pretty displays (or plates) of mac and cheese and BBQ chicken are guaranteed crowd-pleasers. Seriously, ask any potential guest -- whether they're eight years old or 80 — if they'd prefer crispy fried chicken or a baked breast with a fancy sauce — we think we know the answer. Fun food makes for a fun party — and is totally on trend right now. Nothing is sadder to a bride or groom on a budget than seeing a ton of half-finished champagne glasses littering the reception tables after a toast. People can toast with anything they're drinking. If you want bubbly, go with champagne's lower-priced, but still perfectly chic and tasty, cousin — prosecco. Strawberries and other fruits and veggies out of season cost more and are not as tasty—a lose-lose situation for your menu and your budget. So if you're getting married in July, by all means, give strawberry shortcake a place of honor on your dessert table—but if your nuptials are in the fall, serve mini pecan pies as a nod to the season's biggest holiday. Having a midday brunch reception is not only guaranteed to be a surefire hit with your guests (who doesn't love breakfast food? ), but it'll also help you make the most of your budget by cutting your alcohol costs way down. Your guests will love upscale versions of brunch favorites, like lobster eggs Benedict, roasted breakfast potatoes sprinkled with truffle salt and a Belgian waffle bar (with seasonal fresh fruit and homemade whipped cream). For your signature cocktails, put a twist on the classics with a garnish-it-yourself Bloody Mary bar and different types of mimosas.